Before-and-after photo using porcelain veneers. You have an important job interview. Your 15-year high school reunion is just around the corner. Your ex-boyfriend wants you to give a speech at his wedding (oh, brother). Do you have to show up with your same-old smile, self-consciously hiding crooked or stained teeth when you speak? Do you have to wear unsightly metal braces for years, visiting the orthodontist on your lunch breaks? No, no, no. There’s a brace-free secret that celebrities like Ben Affleck, George Clooney, and Demi Moore turn to for their flawless smiles. Porcelain veneers have been used for years to transform dull, crooked, misshapen, and discolored teeth into red-carpet-ready smiles. These modern miracles are often termed instant orthodontics because of their power to remedy gaps and misalignments in just two visits. 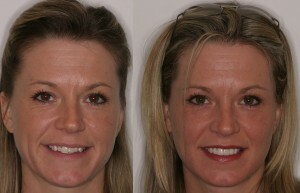 As cosmetic dentists, Dr. Dory Stutman and Dr. Khalida Stutman offer porcelain veneers at our Massapequa dental office. Click here for before-and-after photos of porcelain veneers on the doctors’ actual patients. Modern porcelain veneers are made from high quality dental porcelains that look natural, blend with your smile, and can be placed in two visits. At your first visit, your dentist will consider your goals, facial shape, coloring, and desires to create a custom treatment plan. Models and photographs will help you visualize the outcome. Once the porcelain veneers have been handcrafted, we can place them in a second appointment. The entire procedure is simple, safe, and effective, and your new veneers will resist stains and last long-term. Visit our Massapequa dental office for a cosmetic consultation to learn if porcelain veneers are right for you. As two of the leading cosmetic dentists in the Long Island area, Dr. Stutman and Stutman combine knowledge and expertise to create beautiful, lasting smiles for patients who hail from across New York and Long Island. by: Dr. Stutman's Office at June 11, 2011 .